Many Christians stumble over trying to reconcile the apparent contradictions in Numbers 23:19 and Exodus 32:14. How can the omniscient, immutable God change His mind? 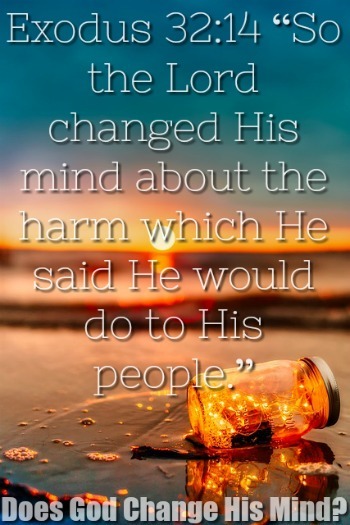 There are two places in Scripture where it says that God REPENTED about something He had done in the past and almost a dozen times where it says that He changed His mind about something that He was about to do. Did God change His mind? Did He do something wicked that He had to repent of? How are we to understand this in light of the rest of scripture? How are we to understand God in light of this apparent contradiction? If the Bible is the Inerrant, God-breathed Scripture, what do we do with these passages? The Doctrine of God is the most important doctrine in all of Christianity. We must know who God is, what His character is, what He has done and will do. This sets up our entire understanding of the other crucial doctrines pertaining to our knowledge of the Trinity, our sin and our salvation. So, knowing how to rightly view these passages is vitally important. So, when we read the historical narrative of Joshua and the battle of Jericho, it will read very differently than the poetry of Song of Solomon. When we read the passage about God being our fortress, we know that based on the proper hermeneutic it isn’t saying that God doesn’t look like a literal castle structure. Literary form is a concept that helps us with these two verses in question. A literary form could be a parable, poem, narrative, prophesy, etc. We also have to ask is this passage a literal description, phenomenological language, or even anthropomorphic language? Anthropomorphic Language is when God describes Himself in human like descriptions. We know that in John 4:24 “God is spirit” so when in Scripture we read that God “stretched out His hand” or about “shadow of His wings” we know that God does not literally have human like hands or bird like wings. In the same way Anthropomorphic language can be using human emotions and actions like pity, regret, sorrow, remembering, and resting. God is conveying eternal aspects of Himself, concepts that are vastly beyond our comprehension, in relatable human-like descriptions. How humbling that God would take the time to explain such a spectacular concept to us, much like a Father explaining to a toddler, so that we can know more about Him? If this passage is not read in light of a proper hermeneutic, it would look like God sent a calamity upon the people out of anger. It looks like God sinned and needed to repent – that God Himself needed a Savior. This is completely wrong and even blasphemous. The Hebrew word here is nacham, translated relent or repent depending upon the English translation. The Hebrew word also means “comforted.” We can rightly say that the people repented, and God eased His judgement upon them. We know that God can’t sin. He is Holy and Perfect. God uses anthropomorphism in this regard to illustrate an emotional concept that is like a man if he repented. In contrast, there are other verses that illustrate that God is completely free from the need to repent because He is God. When the Bible says that God repented or changed His mind, it is not saying that something new has happened and now He is thinking a different way. Because God knows all things. Instead, it is describing God’s attitude changing. Not changing because events have caught Him off guard, but because now this aspect of His character is more fitting to express than it was earlier. Everything is laid out according to how He has ordained. His nature does not change. From eternity past, God has known exactly what was going to happen. He has infinite and complete knowledge of everything that will ever happen. How marvelous and humbling that the Almighty God, creator of the heavens and earth, the very God who holds all of creation together by the power of His will desires for us to commune with Him? Prayer is our communicating with God. It is an opportunity to praise Him, to thank Him, to humble our hearts to His will. God is not a genie in a bottle nor is prayer a magic spell. When we pray, it emboldens our hearts to live in obedience to Christ. Let’s take a look at what the Bible says about the power of prayer. There is clearly power in prayer. We are commanded to pray, and to pray according to God’s will. If we ask for something according to God’s will, He will graciously give it to us. Yet through all of this, God is completely Sovereign. Does prayer then, change God’s mind? No. God is completely Sovereign. He has already decreed what would take place. God does use our prayers as a means of carrying out His will. Think of a time when you prayed to God to change a situation. He decreed before time began that you would pray the way you did and on the day you did. Just as He had already preordained that He would change the direction of the situation. Does prayer change things? Absolutely. When we come to a passage that has anthropomorphism in it, the first thing we need to ask is “what does this teach us about God’s character traits?” Almost always when there is an anthropomorphism describing God to repent or change His mind, it is almost always in light of judgement. God isn’t being convinced by a guidance counselor or being annoyed at a nagging request. He is continuously being as He always is. God has promised to not punish sinners who are repentant. What’s more, God is graciously and mercifully letting us know more about Him by revealing Himself to us in simple to understand human terms. These anthropomorphisms should drive us to worship the Immutable God.